This article is about the metal alloy. For other uses, see Bronze (disambiguation). Bronze is a 80+% copper alloy and 90+% copper&tin alloy (commonly 12–12.5% tin) with often the addition of other metals, such as aluminium, manganese, nickel or zinc, and sometimes non-metals or metalloids such as arsenic, phosphorus or silicon. These additions produce a range of alloys that may be harder than copper alone, or have other useful properties, such as stiffness, ductility, or machinability. The archeological period in which bronze was the hardest metal in widespread use is known as the Bronze Age. The beginning of the Bronze Age in India and western Eurasia is conventionally dated to the mid-4th millennium BC, and to the early 2nd millennium BC in China; everywhere it gradually spread across regions. The Bronze Age was followed by the Iron Age starting from about 1300 BC and reaching most of Eurasia by about 500 BC, although bronze continued to be much more widely used than it is in modern times. There are two basic theories as to the origin of the word. in its earliest form from Old Persian birinj, biranj (برنج) "brass" (modern berenj), piring (پرنگ) "copper", from which also came Serbo-Croatian pìrinač "brass", Georgian brinǰao "bronze", Armenian płinj "copper". The Proto-Slavic theory reflects the philological issue that in the most of Slavonic languages word "bronza" corresponds perfectly to "war metal" (bron – defensive, za – hot-worked metal; cf. zelé(želě)zo – iron,) while at the early stages of the Bronze working it was used almost exclusively for military purposes. The discovery of bronze enabled people to create metal objects which were harder and more durable than previously possible. Bronze tools, weapons, armor, and building materials such as decorative tiles were harder and more durable than their stone and copper ("Chalcolithic") predecessors. Initially, bronze was made out of copper and arsenic, forming arsenic bronze, or from naturally or artificially mixed ores of copper and arsenic, with the earliest artifacts so far known coming from the Iranian plateau in the 5th millennium BC. It was only later that tin was used, becoming the major non-copper ingredient of bronze in the late 3rd millennium BC. Tin bronze was superior to arsenic bronze in that the alloying process could be more easily controlled, and the resulting alloy was stronger and easier to cast. Also, unlike arsenic, metallic tin and fumes from tin refining are not toxic. The earliest tin-alloy bronze dates to 4500 BC in a Vinča culture site in Pločnik (Serbia). Other early examples date to the late 4th millennium BC in Egypt, Susa (Iran) and some ancient sites in China, Luristan (Iran) and Mesopotamia (Iraq). Ores of copper and the far rarer tin are not often found together (exceptions include Cornwall in Britain, one ancient site in Thailand and one in Iran), so serious bronze work has always involved trade. Tin sources and trade in ancient times had a major influence on the development of cultures. In Europe, a major source of tin was the British deposits of ore in Cornwall, which were traded as far as Phoenicia in the eastern Mediterranean. In many parts of the world, large hoards of bronze artifacts are found, suggesting that bronze also represented a store of value and an indicator of social status. 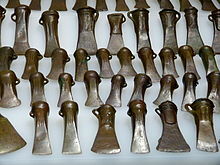 In Europe, large hoards of bronze tools, typically socketed axes (illustrated above), are found, which mostly show no signs of wear. With Chinese ritual bronzes, which are documented in the inscriptions they carry and from other sources, the case is very clear. These were made in enormous quantities for elite burials, and also used by the living for ritual offerings. Though bronze is generally harder than wrought iron, with Vickers hardness of 60–258 vs. 30–80, the Bronze Age gave way to the Iron Age after a serious disruption of the tin trade: the population migrations of around 1200–1100 BC reduced the shipping of tin around the Mediterranean and from Britain, limiting supplies and raising prices. As the art of working in iron improved, iron became cheaper and improved in quality. As cultures advanced from hand-wrought iron to machine-forged iron (typically made with trip hammers powered by water), blacksmiths learned how to make steel. Steel is stronger than bronze and holds a sharper edge longer. Bronze was still used during the Iron Age, and has continued in use for many purposes to the modern day. There are many different bronze alloys, but typically modern bronze is 88% copper and 12% tin. Alpha bronze consists of the alpha solid solution of tin in copper. Alpha bronze alloys of 4–5% tin are used to make coins, springs, turbines and blades. Historical "bronzes" are highly variable in composition, as most metalworkers probably used whatever scrap was on hand; the metal of the 12th-century English Gloucester Candlestick is bronze containing a mixture of copper, zinc, tin, lead, nickel, iron, antimony, arsenic with an unusually large amount of silver – between 22.5% in the base and 5.76% in the pan below the candle. The proportions of this mixture suggests that the candlestick was made from a hoard of old coins. The Benin Bronzes are in fact brass, and the Romanesque Baptismal font at St Bartholomew's Church, Liège is described as both bronze and brass. In the Bronze Age, two forms of bronze were commonly used: "classic bronze", about 10% tin, was used in casting; and "mild bronze", about 6% tin, was hammered from ingots to make sheets. Bladed weapons were mostly cast from classic bronze, while helmets and armor were hammered from mild bronze. Commercial bronze (90% copper and 10% zinc) and architectural bronze (57% copper, 3% lead, 40% zinc) are more properly regarded as brass alloys because they contain zinc as the main alloying ingredient. They are commonly used in architectural applications. Bismuth bronze is a bronze alloy with a composition of 52% copper, 30% nickel, 12% zinc, 5% lead, and 1% bismuth. It is able to hold a good polish and so is sometimes used in light reflectors and mirrors. Plastic bronze is bronze containing a significant quantity of lead which makes for improved plasticity possibly used by the ancient Greeks in their ship construction. Silicon bronze has a composition of Si: 2.80–3.80%, Mn: 0.50–1.30%, Fe: 0.80% max., Zn: 1.50% max., Pb: 0.05% max., Cu: balance. Other bronze alloys include aluminium bronze, phosphor bronze, manganese bronze, bell metal, arsenical bronze, speculum metal and cymbal alloys. Bronzes are typically very ductile alloys, considerably less brittle than cast iron. Typically bronze only oxidizes superficially; once a copper oxide (eventually becoming copper carbonate) layer is formed, the underlying metal is protected from further corrosion. This can be seen on statues from the Hellenistic period. However, if copper chlorides are formed, a corrosion-mode called "bronze disease" will eventually completely destroy it. Copper-based alloys have lower melting points than steel or iron and are more readily produced from their constituent metals. They are generally about 10 percent denser than steel, although alloys using aluminium or silicon may be slightly less dense. Bronze is a better conductor of heat and electricity than most steels. The cost of copper-base alloys is generally higher than that of steels but lower than that of nickel-base alloys. Copper and its alloys have a huge variety of uses that reflect their versatile physical, mechanical, and chemical properties. Some common examples are the high electrical conductivity of pure copper, low-friction properties of bearing bronze (bronze which has a high lead content— 6–8%), resonant qualities of bell bronze (20% tin, 80% copper), and resistance to corrosion by seawater of several bronze alloys. The melting point of bronze varies depending on the ratio of the alloy components and is about 950 °C (1,742 °F). Bronze is usually nonmagnetic, but certain alloys containing iron or nickel may have magnetic properties. Bronze, or bronze-like alloys and mixtures, were used for coins over a longer period. Bronze was especially suitable for use in boat and ship fittings prior to the wide employment of stainless steel owing to its combination of toughness and resistance to salt water corrosion. Bronze is still commonly used in ship propellers and submerged bearings. In the 20th century, silicon was introduced as the primary alloying element, creating an alloy with wide application in industry and the major form used in contemporary statuary. Sculptors may prefer silicon bronze because of the ready availability of silicon bronze brazing rod, which allows colour-matched repair of defects in castings. Aluminium is also used for the structural metal aluminium bronze. It is also widely used for casting bronze sculptures. Many common bronze alloys have the unusual and very desirable property of expanding slightly just before they set, thus filling in the finest details of a mould. Bronze parts are tough and typically used for bearings, clips, electrical connectors and springs. Bronze also has very low friction against dissimilar metals, making it important for cannons prior to modern tolerancing, where iron cannonballs would otherwise stick in the barrel. It is still widely used today for springs, bearings, bushings, automobile transmission pilot bearings, and similar fittings, and is particularly common in the bearings of small electric motors. Phosphor bronze is particularly suited to precision-grade bearings and springs. It is also used in guitar and piano strings. Unlike steel, bronze struck against a hard surface will not generate sparks, so it (along with beryllium copper) is used to make hammers, mallets, wrenches and other durable tools to be used in explosive atmospheres or in the presence of flammable vapors. Bronze is used to make bronze wool for woodworking applications where steel wool would discolour oak. Phosphor bronze is used for ships' propellers, musical instruments, and electrical contacts. Bearings are often made of bronze for its friction properties. It can be filled with oil to make the proprietary Oilite and similar material for bearings. Aluminium bronze is very hard and wear-resistant, and is used for bearings and machine tool ways. The Artemision Bronze representing either Poseidon or Zeus, c. 460 BC, National Archaeological Museum, Athens. This classical sculpture was found in a sunken ship off the coast of Cape Artemisium in 1928. The figure is more than 2 meters in height. The Assyrian king Sennacherib (704–681 BC) claims to have been the first to cast monumental bronze statues (of up to 30 tonnes) using two-part moulds instead of the lost-wax method. Bronze statues were regarded as the highest form of sculpture in Ancient Greek art, though survivals are few, as bronze was a valuable material in short supply in the Late Antique and medieval periods. Many of the most famous Greek bronze sculptures are known through Roman copies in marble, which were more likely to survive. In India, bronze sculptures from the Kushana (Chausa hoard) and Gupta periods (Brahma from Mirpur-Khas, Akota Hoard, Sultanganj Buddha) and later periods (Hansi Hoard) have been found. Indian Hindu artisans from the period of the Chola empire in Tamil Nadu used bronze to create intricate statues via the lost wax casting method with ornate detailing depicting the deities of Hinduism. The art form survives to this day, with many silpis, craftsmen, working in the areas of Swamimalai and Chennai. 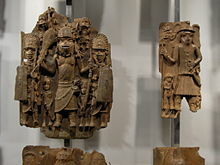 In antiquity other cultures also produced works of high art using bronze. For example: in Africa, the bronze heads of the Kingdom of Benin; in Europe, Grecian bronzes typically of figures from Greek mythology; in east Asia, Chinese ritual bronzes of the Shang and Zhou dynasty—more often ceremonial vessels but including some figurine examples. Bronze sculptures, although known for their longevity, still undergo microbial degradation; such as from certain species of yeasts. Bronze continues into modern times as one of the materials of choice for monumental statuary. Before it became possible to produce glass with acceptably flat surfaces, bronze was a standard material for mirrors. The reflecting surface was typically made slightly convex so that the whole face could be seen in a small mirror. Bronze was used for this purpose in many parts of the world, probably based on independent discoveries. Bronze mirrors survive from the Egyptian Middle Kingdom (2040–1750 BC). In Europe, the Etruscans were making bronze mirrors in the sixth century BC, and Greek and Roman mirrors followed the same pattern. Although other materials such as speculum metal had come into use, bronze mirrors were still being made in Japan in the eighteenth century AD. Bronze is the preferred metal for bells in the form of a high tin bronze alloy known colloquially as bell metal, which is about 23% tin. Nearly all professional cymbals are made from bronze, which gives a desirable balance of durability and timbre. Several types of bronze are used, commonly B20 bronze, which is roughly 20% tin, 80% copper, with traces of silver, or the tougher B8 bronze which is made from 8% tin and 92% copper. As the tin content in a bell or cymbal rises, the timbre drops. Bronze is also used for the windings of steel and nylon strings of various stringed instruments such as the double bass, piano, harpsichord, and guitar. Bronze strings are commonly reserved on pianoforte for the lower pitch tones, as they possess a superior sustain quality to that of high-tensile steel. Bronzes of various metallurgical properties are widely used in struck idiophones around the world, notably bells, singing bowls, gongs, cymbals, and other idiophones from Asia. Examples include Tibetan singing bowls, temple bells of many sizes and shapes, gongs, Javanese gamelan, and other bronze musical instruments. The earliest bronze archeological finds in Indonesia date from 1–2 BC, including flat plates probably suspended and struck by a wooden or bone mallet. Ancient bronze drums from Thailand and Vietnam date back 2,000 years. Bronze bells from Thailand and Cambodia date back to 3,600 BC. Some companies are now making saxophones from phosphor bronze (3.5 to 10% tin and up to 1% phosphorus content). Bell bronze is used to make the tone rings of many professional model banjos. The tone ring is a heavy (usually 3 lbs.) folded or arched metal ring attached to a thick wood rim, over which a skin, or most often, a plastic membrane (or head) is stretched – it is the bell bronze that gives the banjo a crisp powerful lower register and clear bell-like treble register, especially in bluegrass music. Bronze has also been used in coins; most “copper” coins are actually bronze, with about 4 percent tin and 1 percent zinc. As with coins, bronze has been used in the manufacture of various types of medals for centuries, and are known in contemporary times for being awarded for third place in sporting competitions and other events. The later usage was in part attributed to the choices of gold, silver and bronze to represent the first three Ages of Man in Greek mythology: the Golden Age, when men lived among the gods; the Silver age, where youth lasted a hundred years; and the Bronze Age, the era of heroes, and was first adopted at the 1904 Summer Olympics. At the 1896 event, silver was awarded to winners and bronze to runners-up, while at 1900 other prizes were given, not medals. ^ Robert L. Thorp, China in the Early Bronze Age: Shang Civilization, University of Pennsylvania Press (2013). ^ "British Museum, "Scope Note" for "copper alloy"". British Museum. Archived from the original on 18 August 2014. Retrieved 14 September 2014. ^ Henry and Renée Kahane, "Byzantium's Impact on the West: The Linguistic Evidence", Illinois Classical Studies 06 (2) 1981, p. 395. ^ Originally M.P.E. Berthelot, "Sur le nom du bronze chez les alchimistes grecs", in Revue archéologique, 1888, pp. 294–98. ^ Originally Karl Lokotsch, Etymologisches Wörterbuch der europäischen Wörter orientalischen Ursprungs. (Heidelberg: Carl Winter’s Universitätsbuchhandlung, 1927), p. 1657. ^ Wolfgang Pfeifer, ed., Etymologisches Wörterbuch des Deutschen, s.v. "Bronze" (Munich: Deutscher Taschenbucher Vertrag, 2005). ^ Hedden, Thomas Dexter. The Names of the Metals in Slavic and Baltic and Their Significance for the Ethnogenesis of the Slavs, University of California in Berkeley, 1988, pt. 1, pp. 39–51, 168–88. ^ Thornton, C.; Lamberg-Karlovsky, C.C. ; Liezers, M.; Young, S.M.M. (2002). "On pins and needles: tracing the evolution of copper-based alloying at Tepe Yahya, Iran, via ICP-MS analysis of Common-place items". Journal of Archaeological Science. 29 (12): 1451–60. doi:10.1006/jasc.2002.0809. ^ Radivojević, Miljana; Rehren, Thilo (December 2013). "Tainted ores and the rise of tin bronzes in Eurasia, c. 6500 years ago". Antiquity Publications Ltd. Archived from the original on 2014-02-05. ^ Oleg D. Sherby and Jeffrey Wadsworth. Ancient Blacksmiths, the Iron Age, Damascus Steels, and Modern Metallurgy Archived 2007-06-26 at the Wayback Machine. Tbermec 2000, Las Vegas, Nevada December 4–8, 2000. Retrieved on 2012-06-09. ^ Knapp, Brian. (1996) Copper, Silver and Gold. Reed Library, Australia. ^ "Copper alloys". Archived from the original on 11 September 2013. Retrieved 14 September 2014. ^ "CDA UNS Standard Designations for Wrought and Cast Copper and Copper Alloys: Introduction". Archived from the original on 24 September 2013. Retrieved 14 September 2014. ^ "Bismuth Bronze". Archived from the original on 16 March 2015. Retrieved 14 September 2014. ^ Adams, Jonathan R. (2012). "The Belgammel Ram, a Hellenistic-Roman BronzeProembolionFound off the Coast of Libya: test analysis of function, date and metallurgy, with a digital reference archive" (PDF). International Journal of Nautical Archaeology. 42 (1): 60–75. CiteSeerX 10.1.1.738.4024. doi:10.1111/1095-9270.12001. Archived (PDF) from the original on 2016-08-28. ^ ASTM B124 / B124M – 15. ASTM International. 2015. ^ A. Alavudeen; N. Venkateshwaran; J. T. Winowlin Jappes (1 January 2006). A Textbook of Engineering Materials and Metallurgy. Firewall Media. pp. 136–. ISBN 978-81-7008-957-5. Archived from the original on 10 June 2016. Retrieved 25 June 2013. ^ Francesca Cappitelli; Claudia Sorlini (2008). "Microorganisms Attack Synthetic Polymers in Items Representing Our Cultural Heritage". Applied and Environmental Microbiology. 74 (3): 564–69. doi:10.1128/AEM.01768-07. PMC 2227722. PMID 18065627. ^ Von Falkenhausen, Lothar (1993). Suspended Music: Chime-Bells in the Culture of Bronze Age China. Berkeley and Los Angeles: University of California Press. p. 106. ISBN 978-0-520-07378-4. Archived from the original on 2016-05-26. ^ "www.sax.co.uk". Archived from the original on 11 August 2014. Retrieved 18 September 2014. ^ "bronze | alloy". Archived from the original on 2016-07-30. Retrieved 2016-07-21. "Flash animation of the lost-wax casting process". James Peniston Sculpture. Retrieved 2008-11-03. This page was last edited on 19 April 2019, at 21:58 (UTC).